Wanting to review your teams game really bites the big one when your team is not playing one of the games televised on Channel 9, oh and you don't have Foxtel. But thanks to modern technology I downloaded the official Souths Sydney Android app and it was like I was at the game - well not really at all, not even in the slightest actually. 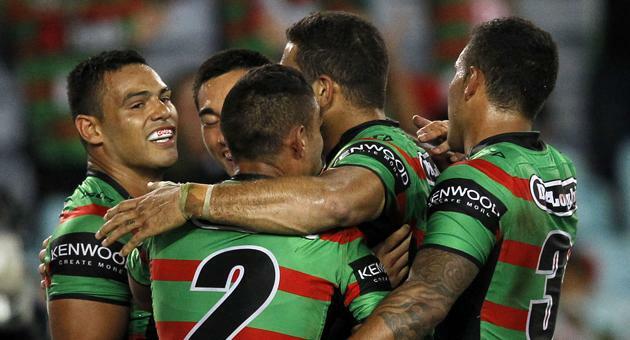 Because I couldn't see the game this week I am reviewing based on the tweets I received from @SSFCRABBITOHS. Souths got off to a screamer! I was excited and yep I was getting ahead of myself. Andrew Everingham scored in the fourth minute off a bomb from Adam Reynolds. Reynolds then converted (of course he did). Issac Luke took Todd Carney out after he kicked and gave away a penalty in the eight minute - who can blame him though! At the 14 minute mark, Dylan Farrell was over for a try off a Reynolds grubber and Adam Reynolds converted. Seriously Adam Reynolds is off to a cracker this season with the boot! Eighteen minutes in and Cronulla hit the score board with a try and conversion. After the start to the season they have had we had to let them score at least once - right? Souths headed to the half-time break leading 14-6. The second half got off to a shabby start it seemed with neither team able to complete their sets. Souths had a Merritt try disallowed, apparently someone obstructed Todd Carney - once again, who can blame them though! On the flip side, Souths received a penalty as Merritt was taken in the air. However, Souths lost the ball and Beau Ryan ran away with it, he was chased by Adam Reynolds but he just couldn't catch him. (Too sweet when Beau Ryan scored though and signalled holding a baby and blowing a kiss to his newborn!) Gordon converted and now it is 14-12 to Souths. This is when I started to hyperventilate just a little bit and also when Twitter told me "Tweets can't be received at this time". WTF!!! With eight minutes left on the clock, Souths lost the ball in Cronulla territory - by this stage I think I was holding my breath and this is only Round 2! Under five minutes remained and it was Todd Carney's turn to lose the ball and Adam Reynolds scored! But they went upstairs....no try because Issac Luke obstructed someone at dummy half. Souths hold on though and win 14-12. Yibbida Yibbida, that's all folks....until next week.